Daily Illuminator: Go Up a Level! May 15, 2010: Go Up a Level! Since its release in 2001, the Munchkin line has become a mega-hit. We couldn't be happier. But games evolve, and in the latest printing (see yesterday's DI) we're changing some cards for clarity or balance. Of course, we don't expect our fans to buy their Munchkin collection all over again. 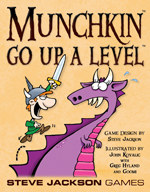 Munchkin: Go Up a Level is the solution. It's meant to replace cards from the sets that Munchkin players already have, bringing them up to date with the changes to cards and rules that started with Munchkin, 19th printing. The card faces are colored to match the sets you already have: everything except classic fantasy is full-color, and the fantasy card faces are brown-and-parchment two-tone. This box contains 132 updated cards from nearly every Munchkin game released so far (excepting Munchkin 6, Munchkin Dice, and the two Munchkin boosters). Changes range from minor (Wandering Monster now talks about "combat strength" rather than "levels") to the balancing (the Wizard's Charm spell is no longer quite such a free Treasure machine). And there's a fan-favorite card returning to the game . . .